Find a retail outlet in a city near you by clicking this link to our Retail Locator. Or if you’re near the Floydada area, come on out to visit us at The Punkin Ranch. Find directions and contact information on our Contact Page. Turks Turban is approximately 6 pounds when it is mature. The colors vary between orange, green, and white. It is typically used for decoration, but can also be used for cooking. 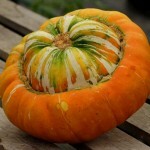 The Cushaw comes in several different color patters: white, green striped, yellow striped, and orange. It varies in size from 8lbs-20lbs. 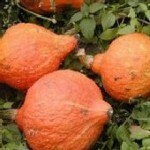 It is known for its edible qualities and is also used for decoration. 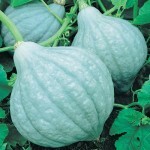 Blue Magic squash is a smaller version of a Blue Hubbard. It has the same great eating qualities as a normal size Hubbard, but is great when needing smaller portions. This fruit weighs 4-6lbs. 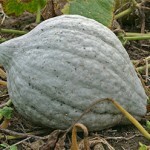 This squash has a grey-blue or orange-red skin. 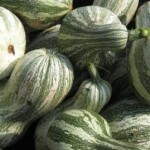 It is remarkably sweet and because of the extra-thick skin, it will store for an extended amount of time. 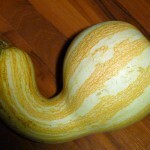 This squash has a orange-red skin. It is remarkably sweet and because of the extra-thick skin, it will store for an extended amount of time. 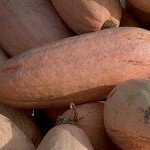 This squash is a salmon pink color and a cylindrical shape. They average 10lbs. The flesh is thick, firm, and meaty with a bright orange color. 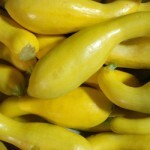 This squash has a lemon-yellow color and is approximately 6 inches long. It has a crooked neck, hence the name. It is great for cooking. 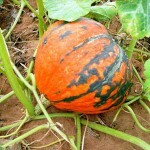 Lakota squash is pear-shaped, orange-red, with green streaks at the bottom. It is great for cooking and decorating. Incorrect Picture. 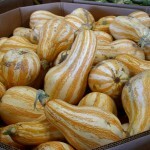 Pan Squash comes in several colors and is sometimes called Starship. Cooking is best at immature stage but many recipes are availble at any stage of development..
Click here if you are a wholesaler and would like information on pricing.